When we talk to each other, we use a wide range of communication tools. We shout or whisper, use a high or low voice and speak slowly or quickly. Light is also a rich source of information. It can vary in color, intensity, polarization and short or long flashes. Light usually consists of countless particles— photons. But if you use single photons, you gain access to a hidden level of information. Quantum phenomena will occur, such as spin and entanglement, making it possible to communicate in perfect secrecy, or to solve complicated mathematical problems with quantum computers. However, producing individual photons is not trivial. Scientists are looking for ways to do that as easily as possible. 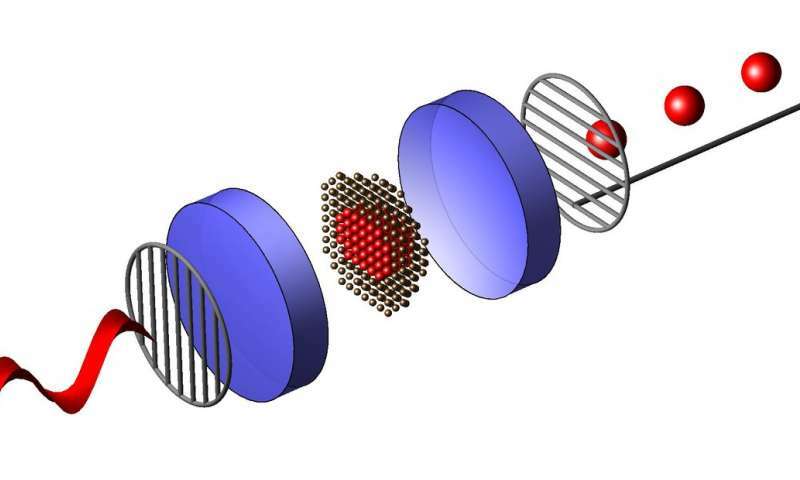 The quantum optics group at Leiden University has now experimentally demonstrated a new method. Physicists create single photons as follows: A laser shines on a large artificial atom—a quantum dot—inside an optical cavity. The cavity captures the laser light, which continues to bounce around until it hits the quantum dot. Within the quantum dot an electron gets excited, after which it falls back to its original energy level, emitting a single photon. Mission accomplished. But, making such a true "single photon turnstile," where the underlying phenomenon is called "photon blockade," is very hard because any residual laser light will spoil the single photons. Leiden researchers have now provided experimental evidence for a different way to produce single photons. Co-authors Vincenzo Savona and Hugo Flayac from EPFL Lausanne came up with the theory for this. In this method—called unconventional photon blockade—the quantum dot within the cavity is excited by light of a certain polarization. Quantum interference then provides a beam of individual photons. "Our method works through a fundamentally different physical mechanism," says lead author Henk Snijders. "That makes this an interesting discovery." How in all the multitude of photons produced, do you differentiate from each photon produced, it appears chance striking the quantum dot where billions of photons are haphazardly striking the electron in the quantum dot. Do you switch your laser of as the first photon is emitted? this article is devoid of almost any detail about how this is achieved beyond prior art. There are no such things as particles. Charge is the center of an E Field described by Coulomb. You can visualize the equal potential spheres about the charge; they always exists; however, if the charge moves it'll take awhile if you'll very far away. Depending upon how you sense the changes within a charges field, visually, specially; I suggest a holistic perspective when modeling, i.e. every point within the subject space and boundary conditions. If Charge then any other particle or force is derivative.